Sea oats are the only real thing separating your family from the white sandy beaches when you stay at this North Myrtle Beach resort. The sea oats are the rustling grasses that fill the sandy dune line and create a bit of a buffer between land and the Atlantic Ocean. And when you make reservations for a beautiful North Myrtle Beach condominium at Sea Oats you will only have to walk a few steps through the sea oats to reach the beachfront. This oceanfront North Myrtle Beach resort is part of the coastline in the Cherry Grove section of North Myrtle Beach, South Carolina. This area of town is popular with families and features the famous Cherry Grove Fishing Pier just down the beach. Sea Oats is an easy North Myrtle Beach resort to find along Ocean Boulevard as it is between 49th and 50th Avenues North right on the beach. Sea Oats is a North Myrtle Beach resort that only has three stories but it features an elevator to get you from the ground level parking up to the top floor if necessary. That is a nice and rare amenity for a three-story North Myrtle Beach resort. This mid-size North Myrtle Beach resort only has five North Myrtle Beach condominiums per floor. It is a quiet setting in a quiet stretch of North Myrtle Beach, South Carolina. At the north end of this North Myrtle Beach resort is a lima bean shaped swimming pool. The sparkling blue swimming pool is close enough to the oceanfront that you can hear the waves crashing ashore. Slipping into this beautiful swimming pool on a hot summer day is a refreshing treat the whole family can enjoy. 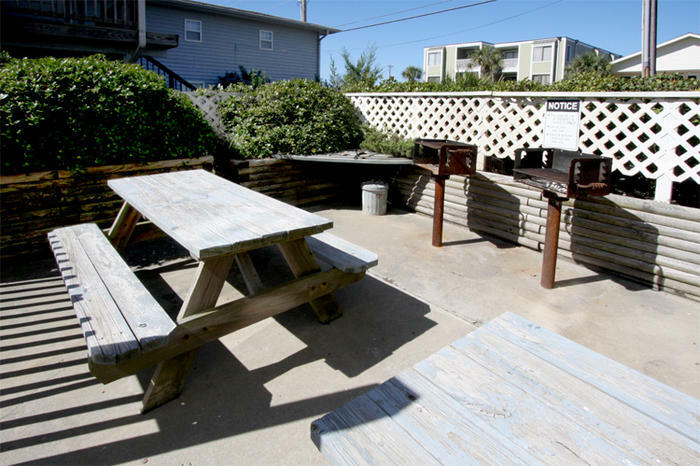 Sea Oats is a North Myrtle Beach resort that is filled with spacious accommodations. The North Myrtle Beach vacation rentals at this oceanfront resort all have three bedrooms and two full baths. Each of these condos in North Myrtle Beach, South Carolina can sleep six in private bedrooms and most of these North Myrtle Beach rentals have a sleeper sofa that will accommodate two more folks, for a total of eight family members and friends in one North Myrtle Beach vacation rental. These North Myrtle Beach condominiums all come with a nicely furnished kitchen that even boasts a dishwasher. You truly can make yourself at home in accommodations that include full-size appliances, coffee maker, breakfast bar and more. The kitchen overlooks the dining area, which is next to the living room. Whether you are relaxing in front of the television in the living room or making yourself a sandwich in the kitchen, everyone can be part of the same conversation at a Sea Oats North Myrtle Beach vacation rental. Elliott Beach Rentals is not affiliated with onsite management or the HOA of Sea Oats.